Book Luxor East Bank Tour. Escorted Luxor's East Bank Half Day Private Tour to Karnak Temple & Luxor Temples to Explore The East Bank of The Nile in Luxor Egypt. 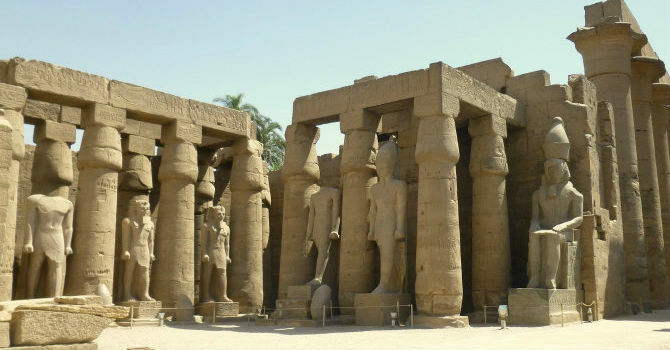 Half Day Trip With Private Car and Expert Guide to Explore the Top Temples in the Eastern Bank of Luxor. We will pick you up from you hotel in Luxor to enjoy an afternoon wander the East Bank of Luxor visiting the impressive temples in Upper Egypt. Start at the temples of Karnak walking across the Sphinx Avenue to witness each legacy left by the different pharaohs as the temple grew even larger. The inner you go into the complex, the deep in time you are traveling, walk through the Great Court into the Great Hypo style Hall with 134 airy columns like an ancient forest. arrive to the sacred lake where king and their intended offerings should be purified. Proceed to Luxor temple 2 kilometer far from the Karnak temples along the Sphinx Avenue, number of pharaoh Ramses II statues are prevailing the scene, It is a real pure Egyptian temple style with inner walls and columns ornamented with hieroglyphics. Explore how Alexander the Great left his name in the temple history, watch one of the original pair of obelisk, second to which now stands on Paris Place de la Concorde . You will get enough free time in each site to explore in leisure before we transfer back to your hotel. Book Dendera & Abydos Private Full Day Tour With Lunch to Explore Visit Seti and Hathour Temples in Private Day Tours to Dendera and Abydos Temples From Luxor By Car. This is The Common Option For People Interested to Wander The Two Famous Temples While They Are in Luxor. Enjoy Luxor Hot Air Balloon Flights. Air Tours in Luxor to Enjoy Hot Air Balloon Ride Over Luxor's West Bank Tombs and Temples. Book Hot Air Balloon Rides For memorable Views of Ancient Thebes in This Peaceful Glow of The Aurora to Make The Highlight of Your Visit to Egypt. Book Private Half Day Tour of Luxor's West Bank Egypt. Guided Half Day Luxor West Bank Tour to Hatshepsut Temple and The Valley Of The Kings Tour Would Really Add an Enjoyable Memorable Experience to Your Visit to Luxor Egypt. Luxor Sound and Light Show at Karnak Temple. Night Tour to Karnak Temple Sound and Light Show Tikets and Transfers to Wander Karnak Temple and Luxor Temple at Night. Daily Night Activity From Your Hotel in Luxor to Maximize Sightseeing of Ancient Thebes. Book Luxor to Amarna tours. 2 Days Trip From Luxor to Al Minya to the Great Plain of Akhenaton, Tel Amarna & Beni Hasan Tombs. Book Overnight Trip to El Minya From Luxor and Travel to El Minya City "Pearl of Upper Egypt". Fly to Cairo for full sightseeing day trips by flight to explore Egypt major attractions in Cairo. Book Luxor Day Tour to Cairo. Trip to Giza Pyramids, Egyptian Museum, River Nile & Old Cairo Tours From Luxor By Flight. Book Edfu & Temple of Kom Ombo Full Day Private Tour With Lunch. Enjoy Escorted Kom Ombo and Edfu Tour to Visit Horus and Sobek Temples Privately From Luxor By Car to Enrich Your Ancient Egypt Experience While You Are Holidaying in Luxor Egypt.